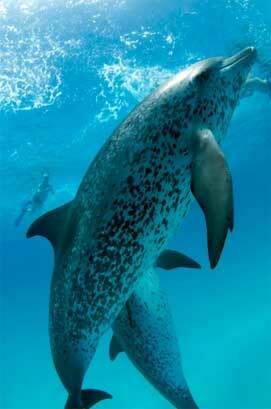 The most instantly recognizable characteristic of the Atlantic spotted dolphin is its spots. Cavles are born totally absent of spots until the age of 6 where the spots appear and increase in size and density until the age of 16 years. Male Atlantic spotted dolphins reach a length of about 2.5 meters with females usually and inch or two longer. This is unusual in Odontocetes (toothed whales), where males are generally larger. Typical group sizes consist of less than 50 animals. Dives can range in depth between 40 - 60 meters; though usually remain less than 10 meters for up to 6 minutes. The Atlantic Spotted Dolphins that appear in Tenerife during two peaks of the year have travelled from The Bay of Biscay and The Bahamas. Their migratory route, seen below, is throughout the equatorial warm waters of the Atlantic.